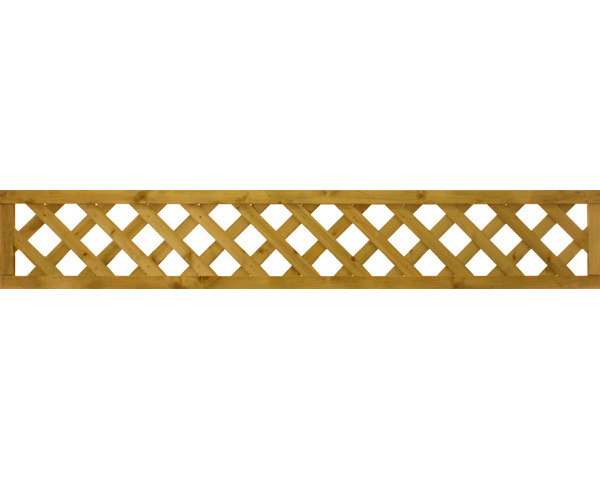 Diamond Trellis Panel Golden 1.83 x 0.31m. Fully framed for strength and rigidity. All batten is cut at 45 degree angle to suit. Ideal for screening or finishing a fence line. Can be used to top off a low fence. Sizes - Width 1.83 metres (6ft). Height ranging from 0.30 metres (1ft) to 1.83metres (6ft). Colours - Dipped Trellis Panel is Golden Brown and Chestnut, Tanalised Trellis Panel is Green.